The Caucasus usually has a slightly tenuous position within this conception of Eurasia, perched almost out of sight. 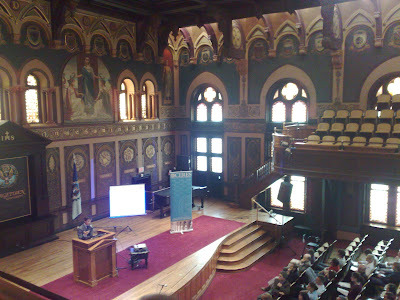 This year, because of current events, it had more prominence (although the grand hall seen in the image below was only used for the keynote address on Afghanistan, otherwise we were in fairly grotty underground rooms). One paper by Reid Hamel, a Ph.D. student in Demography at UC Berkeley and our former Summer Fellow, was based on CRRC data. Separately, we presented results from various opinion surveys at a Georgia-focused roundtable (with Julie George, Stephen Jones, Svante Cornell). Striking, in many of the debates on ongoing issues, how, as one prominent Caucasus scholar put it, everyone is "so eager to confess others' sins". Indeed, one of the main impediments to scholarly debate was the repeated intrusion of standpoint statements ("what you said is an insult to all the victims..."), and the search for moral acclamation. An urgent need, then, to move beyond the exchange of accusations, and for all sides to examine how they contributed to current events, and what they will need to do better. As Percy Cradock, a former British diplomat once put it: it's never the other side you have to worry about, it's your own. That change of approach would go some way towards the statesmanship that the Caucasus now needs: recognizing your own limitations and from such a precise understanding, forge new possibilities. Unrealistic ambitions can hold you hostage, sometimes more than an external power. But in between, constructive debates, a variety of viewpoints, and a very rich list of topics. If you want to see who is working on what types of issues, take a look at the conference program. Kevin Tuite, Paul Crego, Julie George, Babken Babajanian and various other Caucasus scholars were present, and you may be interested in checking out what they are up to.